And so they carried on, affirming and supporting him. I wanted to hug them. But then thought – I had been expecting them to come out with stereotypical comments. In fact I was the one who was guilty of stereotyping, because they looked a bit scary and spoke in very broad scouse accents with the odd ‘F’ word thrown in. I am the one who goes on and on about justice and, albeit briefly, had unfairly passed judgment on someone else! That’s the thing about injustice. It affects real people. Behind every person who is threatened with homelessness or is a victim of catastrophic injuries, or who is having to face the humiliation of a food bank, is a real story. Injustice happens when they are depersonalised. When they become a ‘problem’ on the one hand or a ‘cause’ on the other. We can all be guilty of being too concerned about being ‘right’ than about being fair. So here is belated thanks to those guys on the train. A timely lesson in the real world. Head of NHS Resolution says claimant's refuse to mediate!! 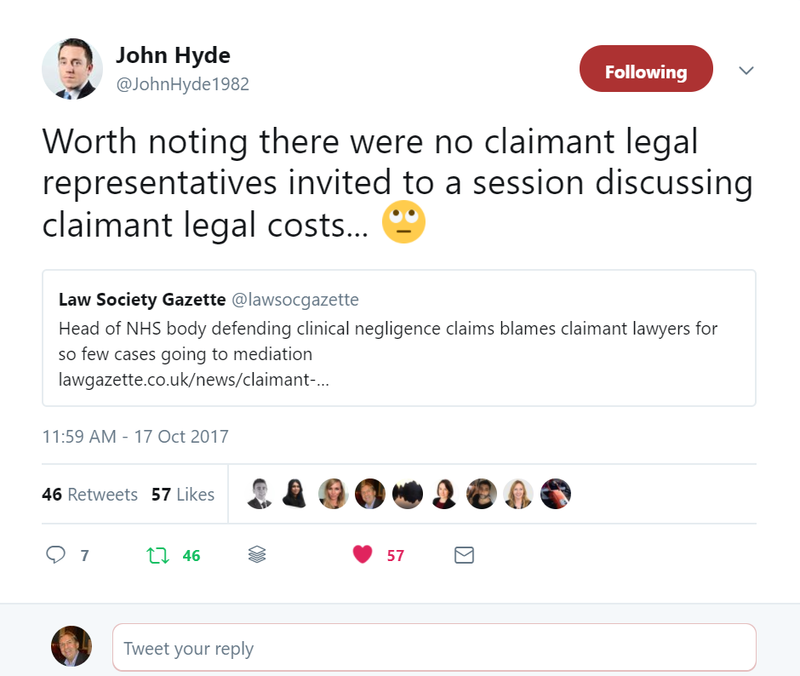 It was really no great surprise when the head of NHS Resolution yesterday blamed Claimant lawyers for the small number of claims which have been successfully mediated since the NHS Litigation Authority changed its name in April 2017. And to give credit where it is due the name has in fact changed. I recently discussed the announcement with a group of claimant lawyers who were unanimously of the view the nothing much else had changed. Yesterday’s assertion was made to the House of Commons Public Accounts Committee by Helen Vernon. She told the committee that few cases had been referred to mediation and shamelessly attributed this to the reluctance of Claimant lawyers to engage in the process. I have litigated hundreds of medical negligence cases and have never refused mediation. Neither do I know any other lawyers who have refused. What Ms Vernon overlooked is that the courts have introduced a huge incentive on parties to resolve claims in this way. There is a power to impose costs sanctions on any party who unreasonably refuses an offer to mediate. Most experienced lawyers include a paragraph in their initial letter of claim offering to refer the case to mediation. This is routinely refused or even ignored. The reason that the NHS give for such refusal is that the matter is disputed – even though the vast majority end up being settled. The last Clinical Negligence case that I dealt with at my last firm was listed for trial in February 2017. We had made an early offer to settle and in 2016 proposed a Joint Settlement Meeting which is designed to resolve disputes without trial. There was no response until less than 2 weeks before trial when the case settled on terms that would have been accepted 2 years earlier. The costs were through the roof by then. If claimant representatives had been there they would certainly have pointed out what a ludicrous statement Ms Vernon made. Claimant lawyers are under a professional duty to achieve the best result for their client. This would never included a refusal to discuss resolution. Costs in clinical negligence cases are a burden on the tax payer. Resolution of claims should be a priority. It takes two to mediate! It is unhelpful for a manager of NHS Resolution to blame one set of lawyers for this. Especially or possibly because those lawyers were not there to set the record straight. 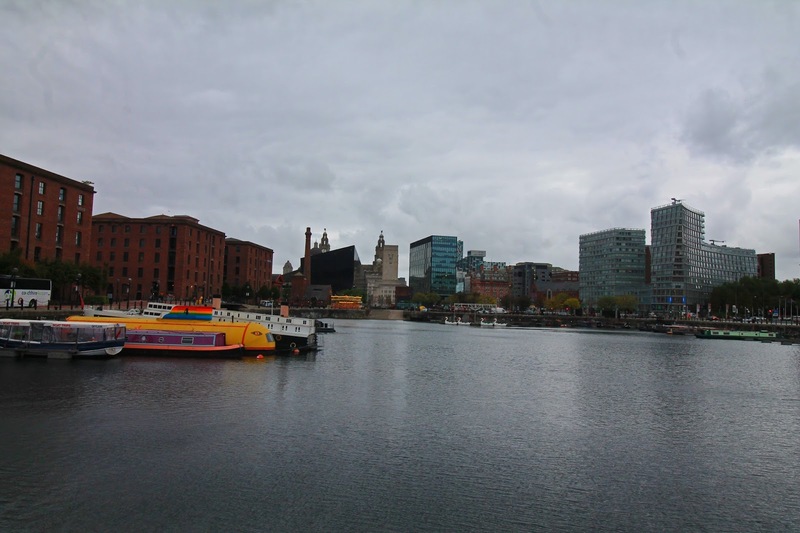 On Tuesday last week, I was proud to be part of the 6th Liverpool Legal Walk. About 150 of us from Law Firms, big and small, walked 5k around the centre of Liverpool. I have to say, it was a very pleasant walk around the city. It really has been transformed beyond recognition over the last few years. And the rain kept off! The highlight of the event was however to see the efforts of the walkers to raise much needed funds for legal charities. The effect of this is that thousands of ordinary people have been left with legal rights that they cannot enforce. ‘Courts exist in order to ensure that the laws made by Parliament, and the common law created by the courts themselves, are applied and enforced. That role includes ensuring that the executive branch of government carries out its functions in accordance with the law. It is also a point I have made on this blog over and over again! I have been involved in this walk since the start. It is fair to say that there was some hesitation at first. 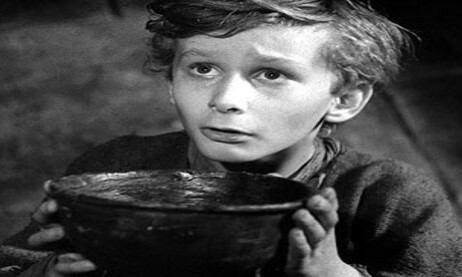 Why should the legal profession be raising funds for legal advice which should be properly funded by the government? That was, and still is, a fair question. But in the meantime, peoples’ fundamental rights are at risk. There is now no alternative to doing all we can, whilst at the same time campaigning for change. Liverpool Law Society have supported the event from the start and John Ballam is the latest President to walk for justice. We were also well supported by the Women Lawyers Division. We were very pleased to welcome the Lord Mayor of Liverpool, Cllr Malcolm Kennedy. At the end of the walk, as we enjoyed a well-deserved drink, he commented that lawyers do not always get a good press! He went on to thank all of those who had given up their time to help secure justice for those in greatest need in Liverpool and across the North West. It is often overlooked that the drive to fight for justice is what led many to become lawyers in the first place. Another well known face was actor, Michael Starke - known to us all as Sinbad from Brookside! So thank you to all of our walkers. We will be back again next year – and we will continue until we are no longer needed. I fear I may be on my zimmer by then! I presented a training course last week, for Liverpool Law Society on Professional Negligence in Personal Injury Claims. These claims have become more common over the last few years. This is partly because of the pressure on firms to delegate work to junior case workers because of limited recoverable costs. It is also because some firms have actively advertised for work. We discussed the things that can go wrong including missing limitation and court deadlines which are often the cause of sleepless nights for PI Lawyers. The most interesting discussion concerned ‘under settlements’, those cases where the client is unhappy with the outcome of the case and wants more compensation. Some of these are fairly straightforward. I acted for a client last year, whose case had settled for £2.5k. We were now 4 yeurs post accident and he still had problems with his knee. His original solicitors had obtained a report from a GP expert who had given him an optimistic prognosis for a soft tissue injury. But he had also said that he would need to be seen by an orthopaedic surgeon if he had ongoing symptoms. This had not been done and the case had settled. The client had not recovered. Further evidence revealed a significant ligament injury and the claim against the solicitors settled for about £24k. That was a clear error by the junior case worker who had processed the claim. The advice from the expert had simply been missed. Under settlement claims are not always that straightforward. The idea of claimants effectively bringing a secondary claim for an uplift is controversial. There are concerns about the growth of a secondary market for these cases, especially when backed up by adverts promising more money. All of this was considered by the Court of Appeal, including Jackson LJ, in the recent case of Thomas v Hugh James Ford Simey Solicitors  EWCA Civ 1303. The original case concerned a claim under the old Coal Miners VWF Scheme. This was a procedure for processing high volumes of cases on the basis of processed work and relatively low fixed fees. So it has many of the features of those cases brought under the PI protocol or fixed fees. In 2001, his solicitors secured an offer of £10,373 for pain and suffering. They wrote to him to say that he might be able to claim further damages if he was no longer able to do – ‘things such as gardening, DIY, home decoration, window cleaning, car maintenance, and car washing.’ The letter went on to say – ‘The amount of compensation payable in such cases can be significant.’ No figure was mentioned. 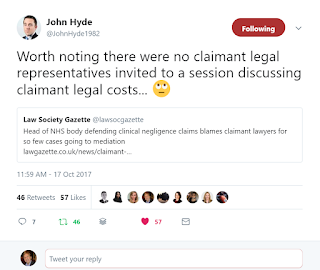 So what will be expected of solicitors as we move into a world where most straightforward PI claims will be – ‘high volume, low value personal injury cases for fixed costs’? Will the bar be lowered? Where will the line be drawn? ‘The civil justice system exists to enable injured parties to recover compensation for genuine wrongs. It does not exist to service artificial claims stirred up by advertisements.’ (my emphasis). So the solicitor has to ensure that the basis issues are explained and understood. But beyond that it is going to be a challenge. It isn’t enough to show that there was an under settlement if the lawyer did what was expected. And any solicitors who are considering advertising for, or buying in these cases, can expect a hostile reception from the courts.